Among the highest percentage shots in tennis and one of my favourite shots is the topspin forehand. It rightfully minimizes the error percentages and most of the time the shot also provides challenges for your opponent to return, especially if they are not used to it. 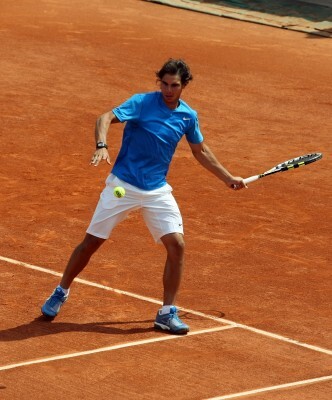 A flat forehand that is well-hit can be very effective and efficient on the tennis court. However, it will be a risky shot if you have to hit the ball lower across the net to stay inside the court, as the percentage of committing an error will be high. A forehand topspin is a much safer choice since the spin lets you hit the tennis ball much effectively higher across the net and have it drop inside the tennis court. Although, almost all tennis players have their own preferences and specialty when hitting the ball in tennis, a topspin whether forehand or backhand always have a very small margin of error, specially if you master it. Below are a few things to consider in improving your topspin forehand. It all depends on the grip. To provide effectiveness and power in your forehand topspin, make certain that your tennis grip should be in a semi-western or western style. Although, continental style of gripping can produce topspin, it is much more tough or difficult to perform since all the spin is produce by the correct swing motion. Semi-western and western grip conveniently and efficiently generate spin by allowing the tilt of the tennis racket head to naturally add spin to your ball striking. Be firm and confident with every shot. You don’t have to strike the ball with all your might. However, if you are apprehensive or unsure and most of the times are backing away from your swing due to confidence issue, you won’t certainly improve your topspin forehand. Deceleration on your topspin swing will produce less distance traveled and less spin power for the tennis ball, resulting in much shorter ball landings inside the court or even worse, most often will hit the net. Provide a good percentage of error for yourself. As you perform a forehand topspin, always remember that no one, that includes professional tennis players, is perfect in producing topspin and in tennis for that matter. By providing yourself a good margin of error will make certain that you are not beating yourself to much. If you are constantly being pushed back away from the baseline, provide a much higher percentage of error for yourself. Like all tennis experts will tell you, practice, training, and refinement is always the essential key in mastering your topspin. Famous pro tennis players did not acquire their excellent topspin shots overnight. Constant practice and honing of their skills for years makes them what they are now. Although, you are not looking to imitate their ways and styles in tennis, but no one can deny that practice surely helps a lot. In addition, aside from acquiring much improvement or even mastery of your topspin through practice, it will also provide you confidence in your every forehand topspin shots. From "Topspin Forehand: 3 Tips To Win More Points With Your Forehand" To "How To Play Tennis Efficiently And Become A Better Player"